There's nothing more frustrating than going to use brown sugar only to find it's morphed into one massive rock on un-usability. But don't despair, or throw it out. Break it up the best you can and place it in a sealed bag, container or jar. Take a broken, clay pottery chard and clean it then soak it in water for about 10-30 minutes. Wipe dry and throw into the container with the sugar. Just lay it on top. 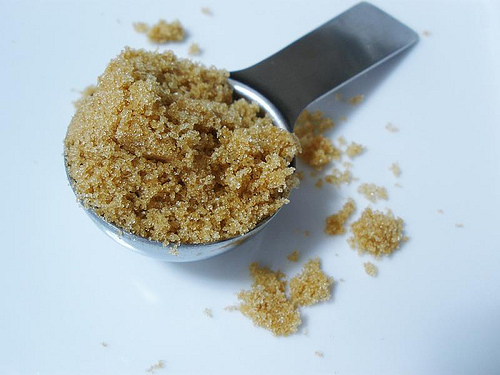 In a few days, the sugar will have miraculously returned to its soft, natural state from slowly absorbing the moisture. It may be necessary to re-wet the shard. Once the sugar is reconstituted (yes, pat yourself on the back for a kitchen disaster avoided), simply keep a wet pottery shard in the sugar at all times. Works like a charm. Add one tablespoon of molasses to one cup of sugar. Mix in well. If you want it a bit darker, add a bit more molasses. Use as you would brown sugar packing it down as you measure.